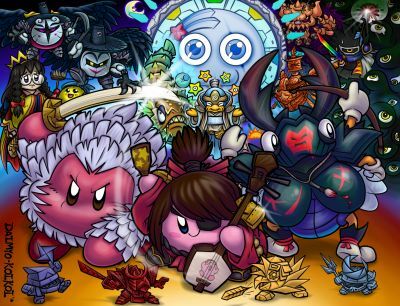 Home > Fan Art Galleries > Dedede-Daimyo > 2D Daimyo Dojo! Alt title: "Hoshi No Kubo"
Album name: Dedede-Daimyo / 2D Daimyo Dojo! I see Sound Test Kirby on the guitar-like-instrument...thing? Very well drawn (As is all your stuff), but I don't think Kirby works as Kubo. The rest is pretty cool, though! Bugzzy!Hanzo is my favorite.